Momma Told Me: Make time for love. The older I get the more I realize that a relationship is work. No, I'm not talking the sort of '10 year quest to slay the Evil Queen and release the fair princess from her spell' nonsense, I'm referring to everyday, real life, challenges. He left his dirty socks on the bedroom floor again, she wants to go see an Opera during the Big Game, his bed friend likes to treat your couch as a home-away-from home, the kids haven't quite passed the co-sleeping phase. There are a number of challenges that come up in a relationship every day, few are as integral as carving out some quality one-on-one time. February dictates you spend at least one day a year celebrating your loving relationships and come together over an intimate meal/movie night/date. But don't let the 14th be the only night for romance, craft your own Romantic Night In to help navigate life's relationship obstacles. When you throw pets, children, and work into the mix, most mature relationships tend to let the basics fall by the wayside. But every relationship requires work to keep it healthy, and both partners engaged. Try to set up at least one night a month where you and your partner can have a neutral meeting time to relax and focus on one another- not on the kids, what's going on at work, or household finances. For many couples the best place to catch up and reconcile a relationship's strengths is in a quiet, controlled, environment, such as their home. 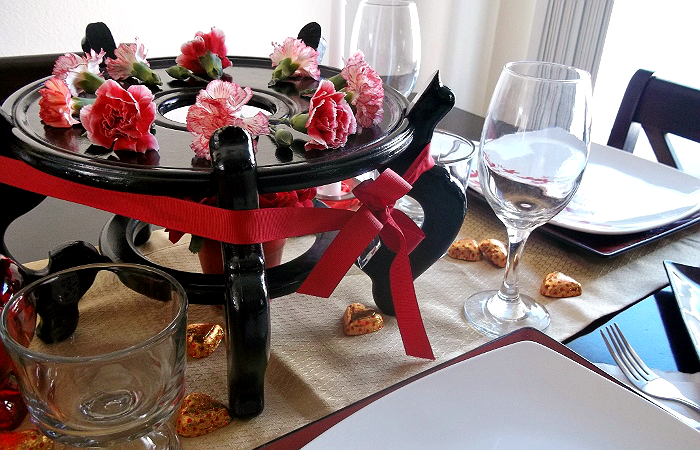 Planning a romantic dinner in can be just as indulgent and intimate as a fine dining excursion outside the house. At the beginning of every month Jay and I like to plan a special meal at home where we can actually sit at our dining table (not the couch, or even the bed) and have an intimate date night over a great meal. 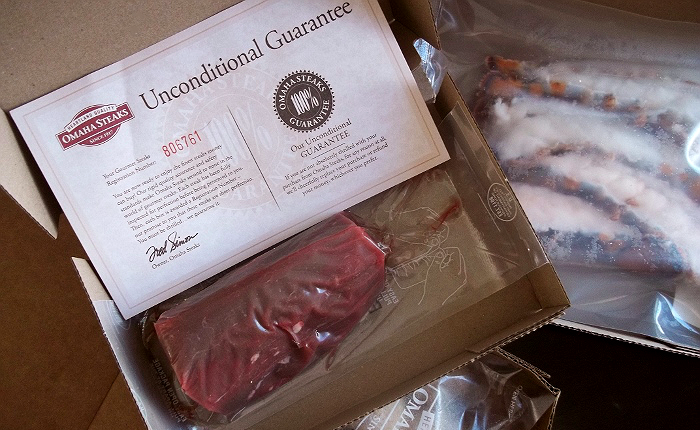 This year, for Valentine's Day, we celebrated early with a Romantic Dinner In package from Omaha Steaks. 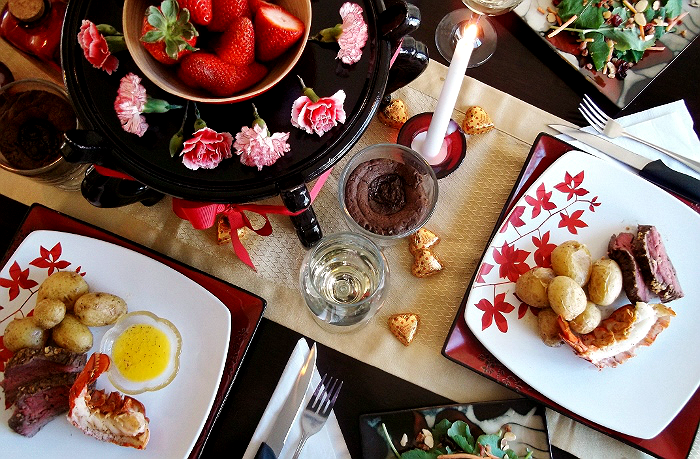 Unless you are paying to have a meal catered, you're likely going to struggle with the preparation of a nice meal vs the relaxation theme of date night, itself. 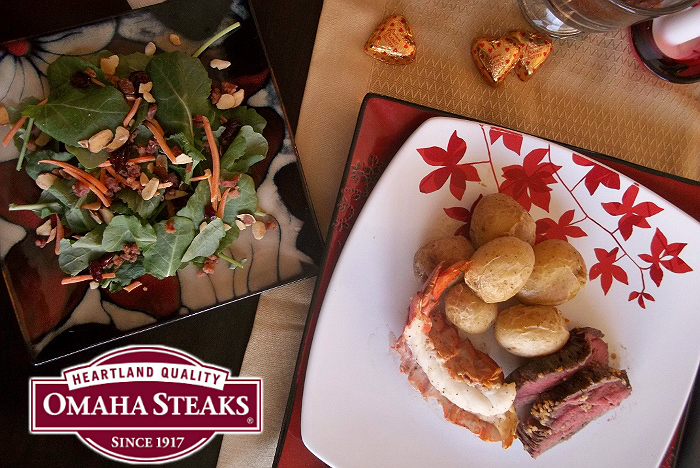 Choosing a pre-built complete meal romantic dinner, such as one of the many 'meals for two' options at Omaha Steaks can provide top quality protein, sides, and even dessert to make an intimate meal a breeze. Because all products arrive frozen, and in most cases ready to cook from frozen, you never have to worry about last minute changes in your plans- the food will be ready when you are. With the 10oz. Chateaubriand Roast, I merely had to season and sear off the sides in a skillet before slow roasting it in the over for 45 minutes. Meanwhile, my Maine Lobster tail halves offered multiple preparation suggestions to fit my kitchen and timing. I chose to broil them with a little lemon butter and cracked pepper, while my baby golden potatoes heated in the microwave, right in the pouch they arrived in! Taking the guesswork out of planning a gourmet meal allows for you to spend more time connecting with your partner. 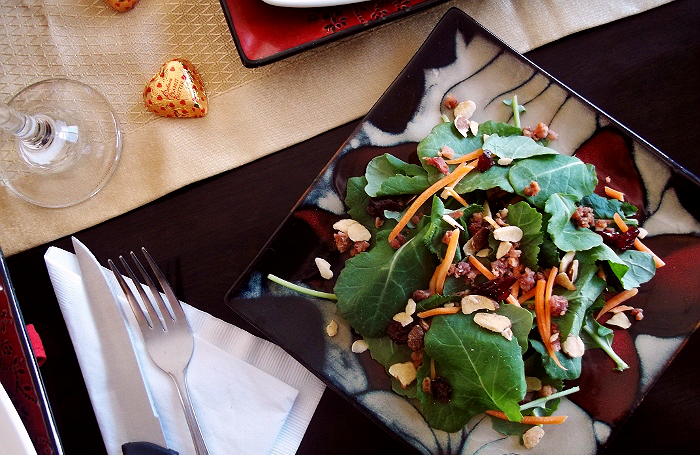 If you're lucky, you can persuade your other half to relax a little and even help make a fresh salad side. Reconnecting in the kitchen can be an unexpected bonus of having a romantic dinner in. If the evening simply isn't feeling special enough, you can always spend a few minutes dressing your dining space with some tall taper candles, included in the Romantic Dinner In, fresh flower petals and buds, and some after dinner foil-wrapped chocolates. Just remember, a little romance in table-setting is elegant, but going overboard might set your partner on edge; keep it elegant but relaxed! 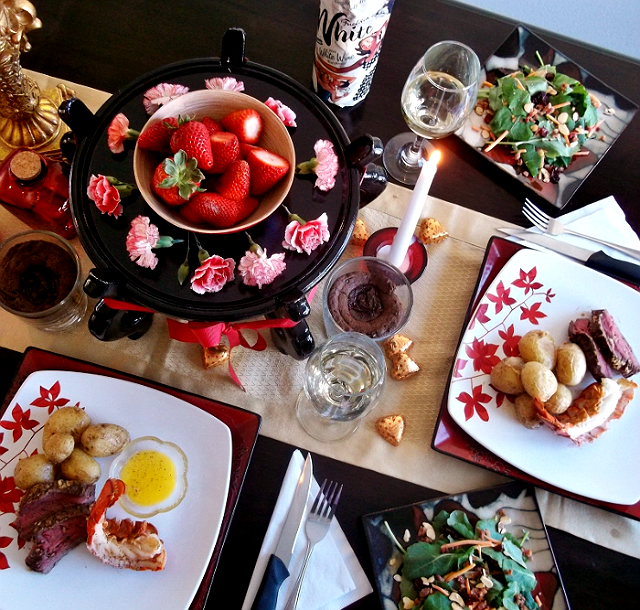 A good romantic dinner at home will require minimal clean-up, and no 'post meal, morning regret.' My Lobster and Chateaubriand Roast dinner was ready to cook from the freezer and left me with only packaging and a few pieces of foil to toss afterwards. Without the stress of a huge mess in the kitchen I could truly sit back and sip my wine while indulging in a tender cut of meat and juicy buttered lobster. For dessert, we finished with Omaha Steaks' individual Fudge Filled Brownies, which offered a decadent molten fudge center and fluffy chocolate cake. In the middle of our centerpiece I'd also prepped some fresh strawberries for enjoyment with wine in a post dinner reconnection and chat. 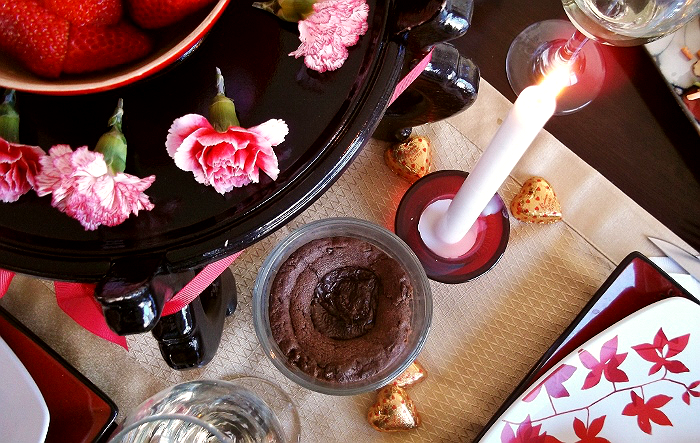 Preparing a romantic dinner in couldn't have been more delicious, or simple! 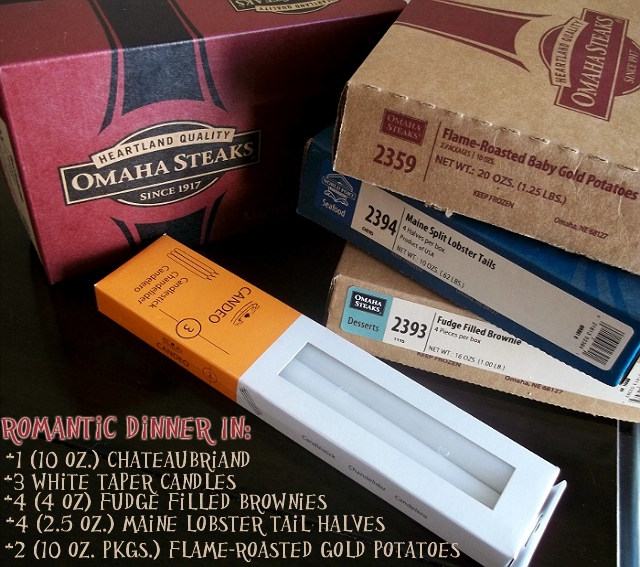 What Daughter Says: Connecting doesn't have to be complicated, choose a complete meal at home for a simple romantic night in. 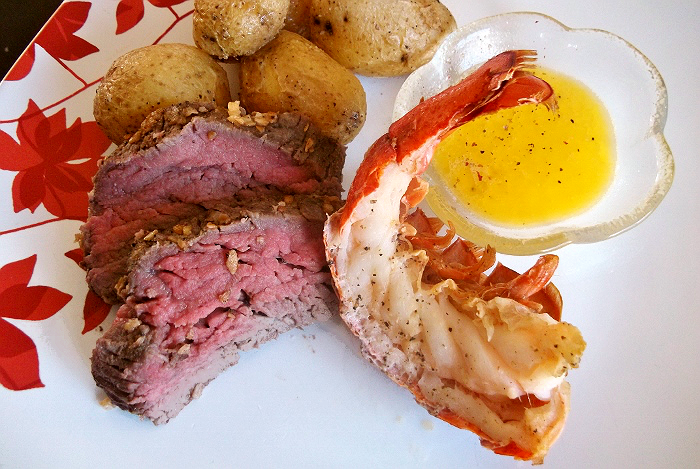 One Momma Told Me follower will win a Romantic Night In bundle from Omaha Steaks featuring a Chateaubriand Roast and Maine Lobster. Hmm, it's a toss up between the salmon and the chicken. Yum! Hands down I would love to try the Filet Mignon Feast the most. I would love the Filet Mignon Feast! I would like to try the Marinated Salmon Platter. Would like to try the Turkey and Trimmings meal. I would like to try the filet mignon feast. I'd love to try The Filet Mignon Feast . Oh my goodness yum... I would love the Filet Mignon Feast! I like the Chicken Cordon Bleu Dinner. Those look yummy!! I love steak. I would like the The Filet Mignon Feast. I'd love to try the Traditional Lasagna Dinner. I would love to try the Meat Lovers Lasagna. Thank you. I'd like to try the Marinated Salmon Platter since I'm a fish person while my partner is the beef guy. I would love to try the Salmon or the Meat Lovers Lasagna. I would try the Sizzling Flat Iron Feast. It looks delicious. Definitely the Filet Mignon feast! I would love the Filet Mignon Feast!! I would love to try the Marinated Salmon Platter complete meal. I'd really like to try the Country Breakfast. I think the Caribbean Combo complete meal sounds so delicious I'm now craving it! They all look delicious, but I'd love to try the Rib Roast meal. 4 Individual Tiramisu Cakes. Thanks. I would love the Surf and Turf. The filet mignon feast looks yummy! I would like to try the marinated salmon platter, looks delicious !! Chicken Cordon Bleu Dinner looks really really good! I'd love the Savory Pot Roast Dinner! Yum! I would love to have the New York Strip Dinner. The prize sounds pretty amazing too. Me and my husband love seafood so I'd love to try the Caribbean Combo. I like the Filet Mignon Feast. I want to try the Rib Roast Meal.